In the most simple terms, the diet we recommend is comprised of a staple pellet diet (75%) and a variety of supplements (25%). If you are interested in the benefits that come along with feeding insects, we have a variety of choices for you. Our dried insects are chemical free, farm-raised, and not gut-loaded with fillers. Along with pellet diets, insects are also a way to maintain good dental health, because they promote intensive chewing action and help keep the plaque buildup down. Not to mention you will soon find that your gliders will mostly likely go crazy for insects, especially mealworms! Mealworm Munchies contain natural, farm-raised mealworms that provide an excellent protein source for your gliders. Mealworms are frozen, then freeze dried to maintain their nutritional value, and store for a year without refrigeration. These, along with our other dried insect options, are a great choice for owners who aren't comfortable handling live or moist/canned insects. Make sure you are not feeding your gliders mealworms every day, or letting them fill up on them as a majority of the diet. Mealworms are high in fat and phosphorus. As you may know, feeding your gliders insects may throw off their calcium to phosphorus ratio. We recommend dusting any insects with Glider-Cal calcium supplement, so you can feel comfortable feeding your gliders this food that they love, without having to worry about calcium deficiency. 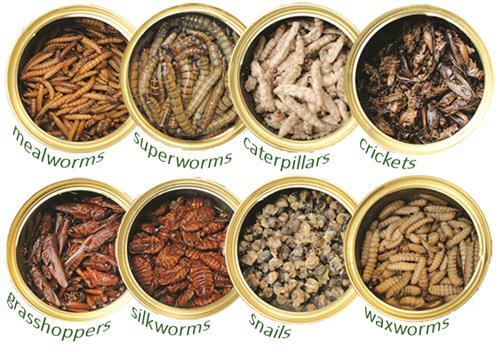 If you want to feel even more secure about Ca:P ratios, try Calci-Worms as an all-natural, calcium rich insect choice. Calci-Worms (black soldier fly larvae) are considered the best new alternative for incorporating calcium and protein into an animal's diet. The variety of natural colors are eye-catching to all animals, and come from being naturally sun-dried to maintain their nutritional value. Black soldier flies are from Canada, and during their larval phase they feed off various kinds of organic material, converting this to proteins. This is why Calci-Worms have such a high nutritional value. Most sugar glider owners know the goal in a diet is to achieve a calcium to phosphorus ratio of 2:1 (over 1), meaning more calcium than phosphorus in the diet. Unlike mealworms, crickets, superworms, etc. Calci-Worms have a ratio of 1.52 (view nutritional comparison chart here). These Calci-Worms have a calcium ppm of 8155, while mealworms have a calcium ppm of only 133! 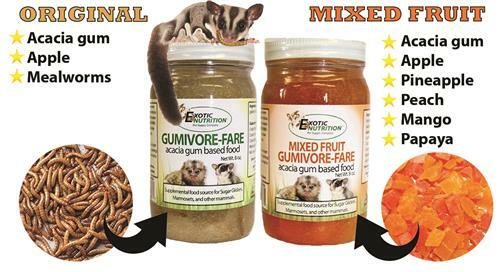 Here at Exotic Nutrition we do our best to give you the largest selection of sugar glider foods out there, which match up with what gliders eat in the wild. In the wild, sugar gliders dig under tree bark in search of nectar, sap, and insects that are found within. We give you the opportunity to provide these types of foods to your sugar gliders using - gums, pollen, sugar beet, honeydew, sugar cane, and eucalyptus branches, powder, and leaves. One of our gum diets, Gumivore-Fare, delivers pure acacia gum (in jell form) combined with small chunks of mixed fruits and fresh fruit pulp. Gliders can't resist this food which is native to their homeland, and owners love it because acacia gum is a very important carbohydrate source. Made with all natural ingredients including acacia gum, pineapple, peach, mango, apple, and papaya. We’ve covered protein, insects, and gums; now let's go into more depth about fruits and vegetables. Portion control is very important when serving fruits and vegetables. For less dense foods that have a higher water content, such as melon, you would offer a larger piece. For denser foods, like sweet potato, you would offer a slightly smaller piece. Fruits and vegetables shouldn’t be canned or frozen, as those can often contain added sugars and other preservatives harmful to sugar gliders. It is also recommended that they are bought and kept fresh, rinsed well, chopped into bite sized pieces, and seeds removed. Fruits and vegetables are important to the diet of your gliders, but buying them fresh all of the time can get expensive, and you may find that there is a short period of time between ripeness and mold. Therefore, you may want to consider dried fruits and vegetables so you don’t have to worry about fruit flies or food spoilage. This form of produce is completely safe and healthy for your sugar glider, and are packaged without preservatives or additives here at Exotic Nutrition. These fruits and vegetables are packaged in an FDA-approved resealable bag for convenience and preservation of freshness. They are sweet and nutritious, and are already chopped into bite sized pieces for you to hand-feed to your gliders. The most popular fruit choices are Fruit Medley (mango, coconut, papaya, pineapple, and raisins) and Island Blend (tiny ⅛“ dices of pineapple and papaya). While the most popular vegetable choice is Veggie Blend (sweet potatoes, carrots, green peas). We also have variety package sets for you to find out your glider’s favorites. When picking and choosing which foods to fill this 25% variety category with, be sure to do your research on the nutritional benefits of each options, and to know which are healthy diets, which are supplemental foods, and which are treats. This is when having our descriptive paragraphs and guaranteed analyses come in handy, versus estimating nutrition content at a grocery store. Healthy treats have several benefits for both gliders and owners. Treats can add behavioral enrichment, provide good exercise for teeth and jaws, and form a connection between you and your gliders. The treats most favored by sugar gliders and best for bonding are Yogurt Drops. Although it is made with nonfat yogurt, as you may guess this is one of the sweetest treats. If you are looking for the treats lowest in sugar and fat, some options are Diced Coconut, Veggie Blend, and Blueberries. Remember to limit treats, and watch for weight gain. Once again, feed what you think will be right for your sugar gliders. One customer favorite are the HPW diets. 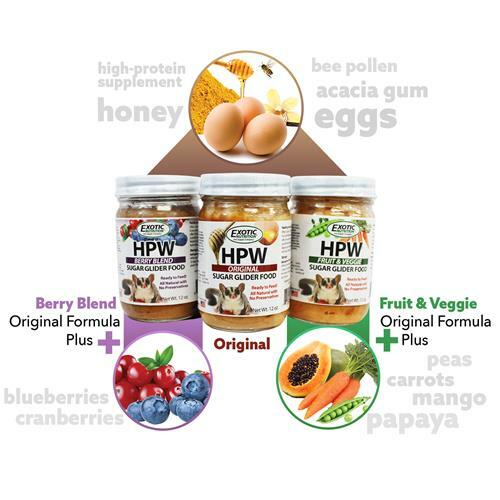 More specifically, Instant-HPW, which includes the major ingredients from the original High Protein Wombaroo diet that is trusted and fed to sugar gliders worldwide. If you didn't know, the High Protein Wombaroo (HPW) diet plan = protein supplement + eggs + honey + bee pollen. We have made this homemade diet plan into an easier, mess-free, pre-made form using dehydrated ingredients. Instant-HPW is a vitamin-enriched, powdered sugar glider diet that mixes with water to form a soft, pudding-textured food. Sugar gliders love the delicious vanilla bean flavoring and natural ingredients including honey, eggs, bee pollen, ZooPro high protein supplement, flaxseed oil, omega-3 and omega-6 fatty acids, calcium carbonate, potassium, magnesium, iron, and nine types of vitamins (A, B1, B2, B6, B12, C, D3, E, K). 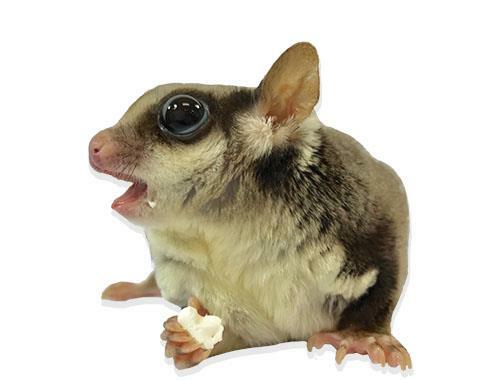 Feeding this diet loved by sugar gliders has never been easier or quicker! Many owners feed this as their gliders' main diet, while some feed 75% Glider Complete with 25% Instant-HPW daily. One owner says - “We have used this for the last 4 years. Our suggies just love it. Super easy to make. We add in fruits and veggies and it's gone before playtime.”. We also offer the ingredients for the homemade HPW Diet, and the premade version called HPW Jar (cooked in a jar). Berries & Bugs is a nutritious insectivore diet containing insect larva, grains, and berries. This diet is formulated specifically for insectivorous mammals like sugar gliders, and can be fed along with a supplemental protein source and vegetables. Some ingredients include tomato pomace, blueberries, adult insects, insect larvae, rosemary, bee pollen, vitamin B-12 supplement, calcium pantothenate, vitamin A acetate, D-biotin supplement, and D-activated animal sterol (source of vitamin D3). Insectivore-Fare is a high quality soft diet, designed to be fed free choice to a wide variety of insectivores, including sugar gliders. Made with calcium carbonate, vitamin E supplement, vitamin B-12 supplement, sources of vitamin D-3 & vitamin K.
Insect-Eater Diet is a fortified, balanced diet containing all natural ingredients for insectivores. New & improved to be even more moist, pressure cooked in an easy-to-feed jar. Contains mealworms, waxworms, fruits, and vegetables. Made with long-chain omega-3 fatty acids, taurine, and no artificial preservatives. 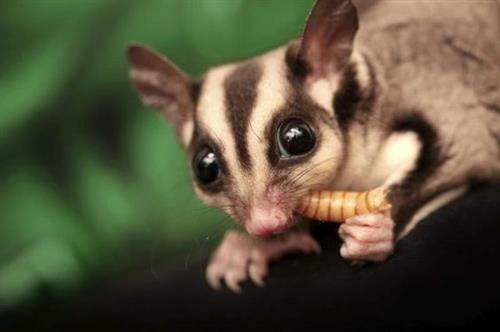 In their natural domain, insects are a primary source of protein for sugar gliders. Offer in an open dish, or it can be placed into hollow openings in branches to allow animals to forage. Other ingredients include whole eggs, beet pulp, apples, carrots, sweet potatoes, honey, tallow, lecithin (source of phospholipids), fish oil (source of omega fatty acids), taurine (amino acid), yeast culture, vitamins and minerals.